I have been wanting to so an Asian slaw for quite some time now. This week, we had some leftover red cabbage and I took that as a sign. What we came out with was so good! 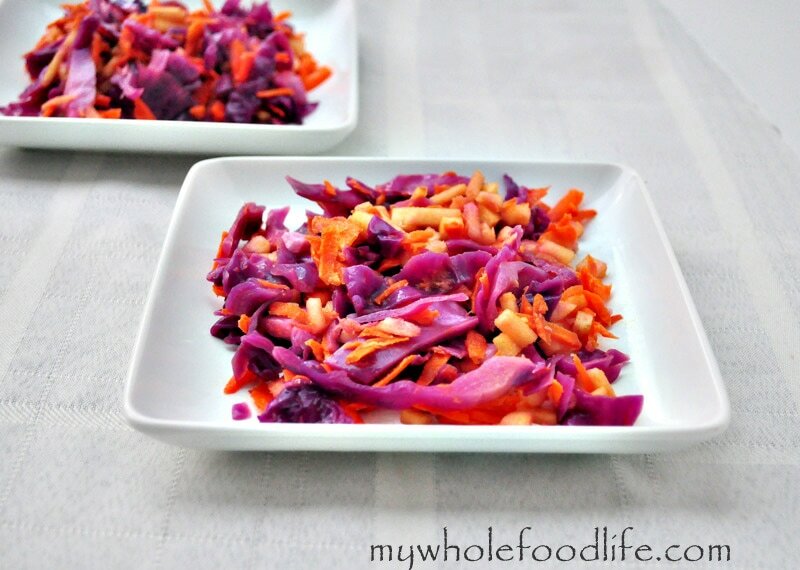 This Asian slaw would be great in some spring rolls, or in an Asian wrap with your favorite protein. It is definitely a dish that will be made often in our house. Just today, I added some cashews to it for my husband’s lunch and he said they were amazing on top. So even though it’s not pictured, I will add it to the recipe. 🙂 This is a quick dish that can be made in a few minutes. Throw the cabbage, apples, cashews and carrots into a large bowl . the remaining ingredients to make the dressing. This made about 4 servings and should last for a week in the fridge. Enjoy! You are welcome Lisa! I hope you enjoy this. This made a great lunch today. We had no apples, but tossed in some cucumber and it was just fine. Husband loved it and wants to try again with the apple this time. Yay! Cucumber is a great addition too! Love it...thank you I have all the ingredients at home. Can't wait to make it. Hi Melissa, Your recipe looks amazing and I would love permission to use this and possibly some of your other recipes on my website recipe page. I will fully credit you and your photo and provide a link to your website. I am a Weight Loss & Emotional Eating Breakthrough Coach who loves to bring my clients nutritious and delicious recipe options. I'll await your response! hi! perhaps a silly question, but i have sesame seed oil and sesame oil, but neither says toasted on the bottle. must it be toasted? thanks! No, regular sesame seed oil should work just fine too. This looks so delicious! I've been wanting to try making slaw for a while - it's just one of those dishes which I wasn't really brought up eating and so never tried making. I've loved it when I've been served it in other places though! This is one of my favourite dishes, one I use often whenever our lettuce is gone...the only addition I make is to add raisins, golden ones, if I have them...the dressing is out of this world, love the cashews and their crunch addition to the salad!! my daughter and I make a huge bowl, and most of the time it is gone, baby, gone!! Thanks for your inspiration! You are so welcome Diane! We love it too!